When the masses latch on to a culture, what makes it unique can quickly become cliché, and nowhere is this more apparent than in New Orleans. Scratch the surface of the garish, exploitative caricatures that are Bourbon Street and Jackson Square, and you will find an intricately woven intersection of musical, culinary, religious, and mystical traditions, their history lying just beneath the touristy surface. If you stop, seek, and listen, they will breathe life into two-dimensional misrepresentations, taking you through sides streets and neighborhoods, then into churches and juke joints, and, finally, into the hearts and souls that make up the city’s true essence. In Judith Richards’ novel, Thelonious Rising, this beautifully aged and tattered tapestry is symbolized by an unlikely protagonist, nine-year-old Thelonious Monk DeCay. “Thelonious” to his loving grandmother, but “Monk” to everyone else, he is, like New Orleans itself, a fusion of race and culture. The son of musicians—a White father and African American mother—Monk has lived with “Grandmama,” his maternal grandmother, in the Ninth Ward since his mother’s death and his father’s “disappearance.” The novel opens not long before Hurricane Katrina devastates New Orleans, and we follow Monk and his friend, Percy, as they make their way nearly daily to Jackson Square to perform for tourists. With bottle-cap taps on their shoes and happy-go-lucky grins on their faces, they amuse large crowds who remain oblivious to the New Orleans outside the “quarter”—especially the realities in Monk’s neighborhood. Richards breathes life and passion into cliché through dialogue, especially conversations among Monk, Percy, and their friend Quinton Toussaint, an older New Orleans native and “dandy.” A historian by profession and music afficianado by passion, Quinton provides background on everything from jazz to Cajun cuisine to Mardi Gras to Monk’s own parents and the music they made. Their world changes when the levees break during Katrina, and Monk narrowly escapes with his life. All alone and wandering the devastated and now-dangerous city, he forms an alliance with Jon Latour, a mentally disturbed loner. The two survive by stealing food and living in the shadows, avoiding detection of first the police and then a dangerous criminal intent on silencing Monk after he witnesses a murder. All the while, Monk’s Aunt Donna, whom he doesn’t know exists, searches the city for any trace of the little boy. 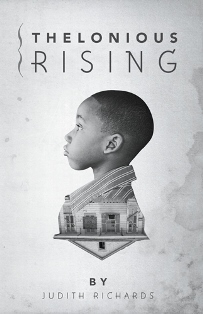 Thelonious Rising is a tale of suspense and sliding doors, intrigue and mystery, and love and redemption. In the weeks and months following Katrina, New Orleans was a place where circumstances sent people beyond their usual boundaries. Richards expertly illustrates all of this. Sweet, guileless Monk becomes a thief, a garden-variety teen-aged thief becomes a murderer, and an unmedicated schizophrenic becomes a savior. Hurricane Katrina and its aftermath shed harsh light on a number of political and social issues in New Orleans, including race, class, and police corruption. Richards covers all of these as well, but instead of pontificating, she weaves them expertly into a well-paced plot that leads us to not only acknowledge the existence of cold-blooded evil, but also to rejoice in the goodness and humanity that dwells in the human heart. That is the soul of New Orleans, and Thelonious Monk DeCay represents it well as he rises from the ashes, along with his beloved home. Bebe Barefoot, a freelance writer, lives in Tuscaloosa and teaches at the University of Alabama.